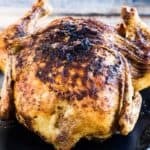 I love to cook a whole chicken in my air fryer. The skin comes out shatteringly crisp and the meat is succulent and flavorful. I rub a simple spice blend and a bit of olive oil on the outside for flavor. This version has a bit of a Mexican twist, but you can substitute any spice rub you like. I like to dry brine my chicken (generously salt it and let it sit in the fridge, uncovered, for anywhere from a couple of hours to overnight), but this step is optional. If you want to cook your chicken straightaway, just start with Step 3 of these instructions. I often serve the chicken straight out of the fryer or shred the meat and set it aside for other meals. It makes a great filling for Homemade Chicken Enchiladas, Tamales, Gluten-Free Chicken Pot Pie, or any number of other dishes. Trim any excess skin or fat from the chicken and then shower it generously all over with salt. Separate the skin from the breasts and rub some salt underneath the skin, as well. Place the chicken in a large baking dish or roasting pan and then refrigerate it, uncovered, for at least 2 hours and up to 24 hours. To make the rub, in a small bowl, stir together the garlic, paprika, cumin, coriander, salt, and pepper. Rub the chicken all over with the olive oil and then with the spice rub, rubbing some of the mixture underneath the skin. Place the chicken into the basket of the air fryer with the breast side down. Cook on 350ºF for 30 minutes. Remove the basket from the air fryer and carefully flip the chicken over (I use large spring-loaded tongs). Return the basket to the air fryer and cook for another 30 to 40 minutes, until the chicken reaches 165ºF on an instant-read thermometer. Remove the chicken from the basket and let rest for at least 10 minutes before carving.